Dr. Andreas Leupold has been advising and representing clients from Germany, England, USA and many other countries mainly in IT Law, Technology, 3D Printing, Media and Trademark Law, Copyright and Unfair Competition Law. Dr. Leupold is the editor and co-author of the handbook “3D Printing” which he wrote with a team of over 30 contributors that features industry leaders such as Terry Wohlers of Wohlers Associates and Peter Sander of Airbus Industries. He is a founding member of the supervisory council of the network “Mobility goes additive” initiated by the German Railway Deutsche Bahn. Here, he discusses the importance of protecting intellectual property and data in additive manufacturing. 2018 will be an exciting year for 3D printing. Additive manufacturing (AM) has, for a long time, been mainly used in tool and prototype construction, and it is now moving into series production. Adidas recently announced that in the coming year it will be producing 100,000 Futurecraft sneakers using Carbon’s digital light synthesis technology and Airbus is cooperating with Daimler and the systems producer EOS in the additive mass production of aluminium parts. These and other developments in AM have not escaped the eyes of lawyers for emerging technologies following market changes and their effects on the legal prerequisites for reducing business risks. With the rapidly advancing industrialisation of 3D printing, the legal questions that these pose are gaining importance, in particular, intellectual ownership of construction data and 3D printable designs and 3D models. No matter the specific process, additive manufacturing (AM) can’t exist without a digital stream of data. From 3D CAD design through to final inspection, computer files define the intellectual property (IP) of the part itself, the build set-up, process settings, any monitoring steps, and complete provenance. In this age of hacking and cyber attacks, manufacturers must consider whether this data is vulnerable to being stolen, misused or purposely corrupted. One company tackling this problem is Identify3D, founded in 2014 and about to launch a trio of targeted software tools in Q1 2018. Where you live should not determine whether you live or die, to quote Bono, lead singer of the rock band U2, but, sadly, it often does. I was reminded of Bono’s phrase as I was reading about the contribution that Silicon Valley–based 3D-printing technology company Carbon (Redwood City, CA) made to the development of a low-cost, easy-to-use in vitro diagnostic (IVD) device to test for tuberculosis (TB). Of the 10 million people that contract TB globally each year, more than 40% go undiagnosed or unreported, the vast majority of whom live in the developing world, according to the World Health Organization. To address this issue in countries with limited healthcare infrastructures, the Global Good Fund (Bellevue, WA) got to work. A collaboration between Intellectual Ventures (IV; Bellevue, WA), a private enterprise involved in the development and licensing of intellectual property, and Bill Gates, the Global Good Fund spearheaded the development of an easy-to-use, affordable early TB diagnostic device. Carbon brought its expertise to the project, which resulted in the manufacture of hundreds of these devices for use in field trials. DNV GL is a quality assurance and risk management company that helps businesses obtain safety and sustainability through classification, certification, and other services to a wide range of industries, including the maritime, oil and gas, power, and renewables industries. The company has been frequently involved with 3D printing lately, particularly in the maritime arena, and now it has published the first classification guideline for the use of additive manufacturing in the maritime and oil and gas industries. The classification guideline is intended to ensure that parts produced via 3D printing, and the materials from which they are printed, have the same level of quality assurance as those produced by traditional means. Create It Real, a Danish 3D printing company, has established a pilot project with the Green Ship of the Future consortium to explore printing on board ships and address Intellectual Property (IP) rights. The project is part of the Green Ship of the Future’s ‘The maritime opportunity space of 3D print’ portfolio, and will specifically look into the streamlining of its supply chain by printing spare parts as and when necessary. It is being financed by the Danish Maritime Fund. Researchers have found that 3D printing technology can help improve the strength and ductility of objects. Recent research on 3D print technology in order to improve strength and ductility of objects has found that the technique can be used to improve the properties of its elements. “Strength and ductility are natural enemies of one another, most methods developed to strengthen metals consequently reduce ductility. The 3D printing technique is known to produce objects with previously inaccessible shapes, and our work shows that it also provides the possibility to produce the next generation of structural alloys with significant improvements in both strength and ductility,” said Leifeng Liu, of the University of Birmingham. 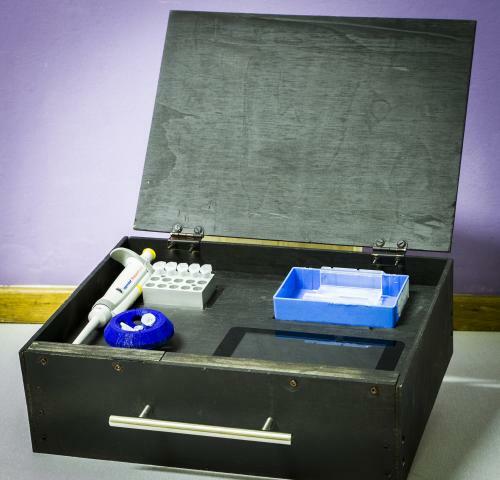 South African biotech startup Akili Labs has developed FieldLab, an accurate, affordable and portable 3D printed diagnostics lab that can cost as little as $1,500, or one-tenth of similar equipment. The FieldLab was created by Akili Labs co-founders and Rhodes University Biotechnology Innovation Centre (RUBIC) graduate students Charles Faul and Lucas Lotter. Their aim is to give doctors and scientists a rapid and accurate means of identifying disease outbreaks on the spot. FieldLab is a rapid field-testing “lab-in-a-box.” It allows medical professionals in remote areas and conflict zones to access equipment typically found in state-of-the-art diagnostic laboratories. By testing for certain viruses, bacteria, and fungi on site, they can quickly identify an outbreak of disease and take the necessary measures before it spreads and becomes an epidemic. 3D printing offers “a tantalizing step toward changing the manufacturing processes” for personalised medicines says a US FDA scientist. As a bourgeoning technology with a world of potential, 3D printing is regularly referred to as the manufacturing technology of the future, and is hailed as having many environmental benefits over existing mass production processes. And while some of its environmental advantages are difficult to deny—3D printing has, after all, opened up unprecedented possibilities for customized, local production—a new series of articles published in Yale’s Journal of Industrial Ecology suggest that the sustainable potential and environmental impact of 3D printing technologies are not quite as defined as many companies would like consumers to believe.